Summer isn’t over quite yet, so that means there’s still time for some summery beach outfits! I recently went on a much needed vacation and relaxed on the beach all week. 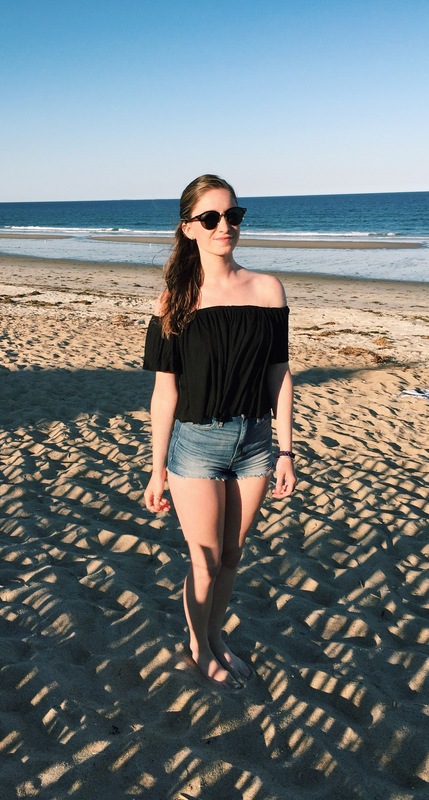 I thought it would be fun to share some of the beachy outfits I wore, so here they are! I saw this bodysuit and had to have it! It’s fun and perfect for a casual beachy look. I really love this headband and how it adds some bright color to an otherwise rather neutral outfit. Overall, you can’t really go wrong with a witty bodysuit paired with high-waisted shorts! This bralette was in my favorites a few months back and I’m still loving it! The bralette makes the look fairly low-key, so I added a baseball hat as well. A baseball hat with a shark on it, very appropriate for a beach outfit. I added super high-waisted shorts and my red sunnies to complete the look! This is another bodysuit, but this time styled sans pants for an even beachier vibe. This Fila bodysuit has a zipper up the front and is really comfortable. Add some bright sunglasses and a pineapple cup and this look is complete for a relaxing beach day! I really like that this top is off-the-shoulder and it’s super comfy! I paired it with super high-waisted shorts and my sunnies to keep this outfit cute, yet relaxed. You could dress this top up a bit if you preferred, but we were going to a casual dinner at the beach so I kept it low-key. IN DA COMMENTS let me know which outfit was your favorite! Thanks girl! Oh stop, I’m sure you’d rock ’em!